« What is the mechanism of Apical Ballooning in Takotsubo cardiomyopathy ? Does hypokalemia paralyse the heart too ? Human physiology can dramatically surprise us.Here is a situation regarding K+ ion and cardiac function. What happens when K + is critically low ? We know, K + is the vital ion that maintain not only the membrane potential ,(Recall Nernst potential ) but also keeps the action potential floating and dipping with every beat. However , ECG changes are expected 100 % of time with falling K + especially below 3meq.Surprisingly , low K + levels have little mechanical impact. (Or is it our ignorance,considering the fact , cardiac electrical mechanical activities are tightly coupled? )We have to find answer from patients like this . A 30 year old women came with breathlessness and fatigue and her ECG. Can we afford to miss a diagnosis of STEMI ? With all our collective wisdom STEMI was diagnosed promptly . . . of course wrongly ! Her K + was 2.3 Meq. The LV function was significantly impaired with global hypokinesia, which improved with correction of K+. She was later referred for nephrology work up , they had made a possible renal tubular disorder for the Hypokalemia. 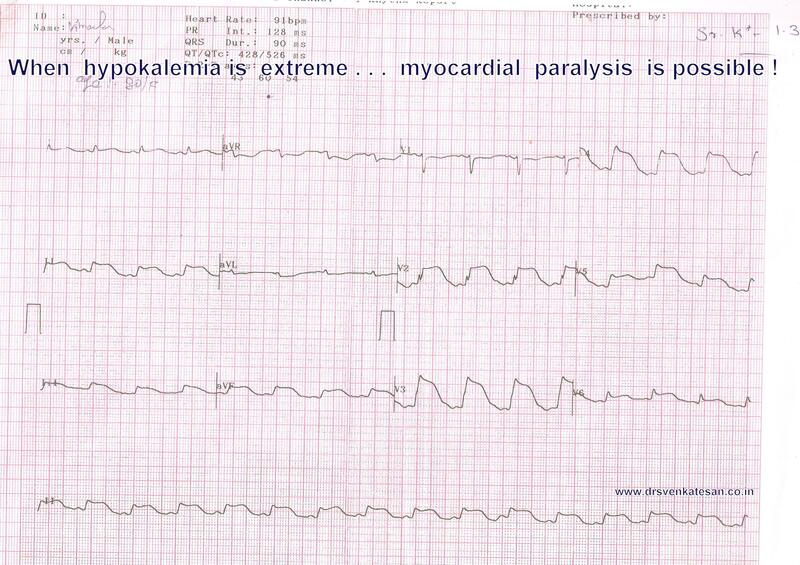 When potassium levels are critically low myocardial function may deteriorate.Here is a patient with dramatic STEMI like ECG with extreme hypokalemia. Experienced physicians do not form hurried opinion.Wait . . . allow things to settle down and assess again.After all ,there is long list of causes for ST elevation other than STEMI ! 1.Chest. 1979 Feb;75(2):189-92.Cardiac dysfunction in a patient with familial hypokalemic periodic paralysis.Kramer LD, Cole JP, Messenger JC, Ellestad MH. 2.Acta Neurol Scand. 1978 Dec;58(6):374-8.Hypokalaemic periodic paralysis and cardiomyopathy.Schipperheyn JJ, Buruma OJ, Voogd PJ. 3. Acta Neurol Scand. 1981 Jul;64(1):12-21.Heart muscle disease in familial hypokalaemic periodic paralysis.Buruma OJ, Schipperheyn JJ, Bots GT. I am sure 100% there is something else going on here. This is never a typical ECG for hypokalemia! 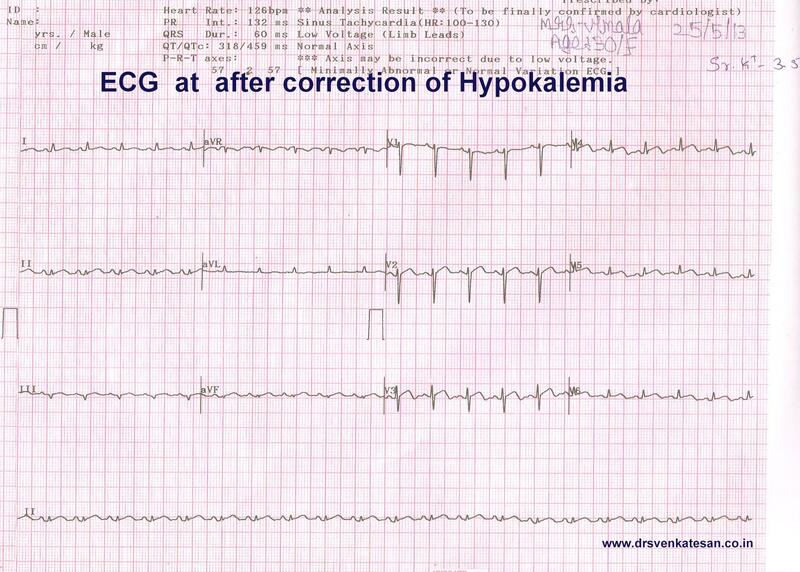 Hypokalemia is associated with ST depression and not ST elevation.